Colon polyps are small clumps of cells that form in the lining of the colon. Usually, colon polyps are harmless, but sometimes they can be indicative of a more serious condition such as colon cancer. Colon polyps can develop at any age, but are most commonly found in those over 50. Even if colon polyps do not cause any symptoms, monitoring is still important because they can be safely removed during their early stage. There are three types of colon polyps: adenomatous, serrated and inflammatory. The most common form accounting for two-thirds of cases, adenomatous polyps are quite unlikely to become cancerous, though the risk albeit slim is still present. Serrated polyps are more likely to be cancerous, particularly if found in the lower portion of the colon. Lastly, inflammatory polyps may occur due to another condition, such as colitis or Crohn’s disease. Inflammatory bowel disease diagnosis increases the risk of colon cancer more than the presence of inflammatory polyps, which are usually benign. The good news is, diet can play a large role in colon polyp formation, and natural home remedies can be utilized for preventing colon polyps or reducing the risk of associated complications. Here are some dietary tips and guidelines for preventing colon polyps. Eat foods that contain curcumin or quercetin: Curcumin is what gives certain spices their intense yellow color and has been used in Chinese and Ayurvedic medicine for centuries. Quercetin is a bioflavonoid found in onions, for example. In studies of both curcumin and quercetin, polyp sizes have been found to decrease. Reduce fat intake, especially from animal sources: Studies have shown that a diet high in animal fats increases the risk of intestinal polyps along with colon cancer. On the other hand, a diet high in fatty fish and healthy fats from nuts and oils was shown to prevent polyps and lower the risk of colon cancer. Removing animal protein as your main protein source and replacing it with healthier alternatives can help reduce the risk of polyps. Get adequate vitamin D: Getting in adequate amounts of vitamin D can help prevent polyp development. Vitamin D can be sourced through sunlight primarily, but there are some dietary sources, too, like fortified cereals and eggs. Maintain a healthy calcium-to-magnesium ratio: Calcium has been found to yield protective effects against polyps in the presence of magnesium. Keeping both minerals in a perfect proportion can better help prevent the development of polyps. A ratio of 1:1 calcium to magnesium is advised. Eat foods that contain sulphoraphane: Sulphoraphane can be found in broccoli and other cruciferous vegetables. In animal studies, sulphoraphane was found to offer protective effects to the intestines and prevent the formation of polyps. Is Magnesium a New Solution To Colon Cancer? Colorectal cancer is attributed to 9 per cent of new cancer patients every year planet wide. It remains one of the most curable cancers if diagnosis is made early. Both high magnesium and calcium levels have been linked to reduced risks of the disease, but studies have also shown that high calcium levels inhibit the absorption of magnesium. According to Qi Dai, MD, PhD, Americans have high calcium intake, but also high incidence of colorectal cancer. “If calcium levels were involved alone, you’d expect the opposite direction. There may be something about these two factors combined – the ratio of one to the other – that might be at play, “notes Dai. 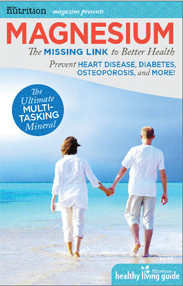 At the 2008 American Association of Cancer Research conference, researchers reported their findings1 from a large clinical trial that revealed supplementation of calcium only reduced the risk of cancer recurrence if the ratio of calcium to magnesium was low, and remained low during the intervention period. The commonly agreed-upon ratio of 2:1 calcium to magnesium found in many supplements traces back to the French scientist Jean Durlach,3 who stipulated the 2:1 ratio as an outermost not-to-be-exceeded level when considering calcium intake from all sources (food, water and supplements). This has been largely misunderstood and is taken as a recommendation of a 2:1 calcium-to-magnesium imbalance. I recommend monitoring calcium intake and taking into account calcium from dietary sources, supplementing with a highly absorbable form of magnesium such as magnesium citrate powder and balancing calcium on at least a 1:1 ratio with magnesium. Aim for an even magnesium calcium balance of 700mg each. 2. Feskanich, D, WC Willett, and GA Colditz. 2003. “Calcium, Vitamin D, Milk Consumption, and Hip Fractures: a Prospective Study among Postmenopausal Women. Am J Clin Nutr (Feb) 77(2): 504–11. 3. Durlach, J. 1989. “Recommended Dietary Amounts of Magnesium: Mg RDA.” Magnes Res (Sep) 2(3): 195–203. http://www.ncbi.nlm.nih.gov/entrez/query.fcgi?cmd=Retrieve&db=PubMed&dopt=Citation&list _uids=2701269. 4. Ko HJ1, Youn CH, Kim HM, Cho YJ, Lee GH, Lee WK.2014. “Dietary Magnesium Intake and Risk of Cancer: A Meta-Analysis of Epidemiologic Studies. “ Nutr Cancer. 2014 Jun 9:1-9.